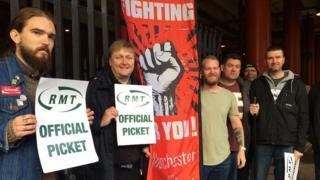 Fresh rail strikes by workers at five rail companies have been announced by the Rail, Maritime and Transport (RMT) union. Members at Southern, South Western Railway and Greater Anglia are to stage 48-hour strikes on 8 November in a row over driver-only trains. Merseyrail and Arriva Rail North (Northern) are to walkout on the same day, but for 24 hours. Greater Anglia said it was disappointed and wanted to resolve issues with RMT. The union is in dispute with the rail companies over driver-only-operated trains which the RMT claim would be unsafe and lead to job losses. Rail companies say a guard would no longer be needed but deny jobs would be lost. What does a train guard do? The RMT says it has made "every single effort" to resolve the disputes, accusing the train operators of "suspending" normal industrial relations. The union has been in dispute with Southern for over 18 months, involving more than 30 days of strike action. It has spread to Merseyrail, Arriva Rail North and Greater Anglia, which have also been hit by walkouts. But this is the first time South Western Railway, which only recently took over the franchise from South West Trains, will be targeted for a strike. It has been accused by the union of refusing to give a "cast iron guarantee" that a second, safety-critical member of staff, will be retained on trains. Richard Dean from Greater Anglia said: "We value our conductors highly and have guaranteed their jobs until the end of the franchise in October 2025. "In fact, we will be recruiting additional conductors as we are replacing all of our trains with brand new trains from 2019 which will enable us to run more services." South Western Railway described the strike as "unnecessary and disruptive". "No-one wants this, least of all our passengers and staff who will be the ones to suffer." Govia Thameslink Railway, parent company of Southern, said it was "very disappointed" and also described the action as "unnecessary" adding the union had continued to refuse to engage with it in modernising the railway. Richard Allan, from Arriva Rail North (Northern), said: "We are prepared to guarantee jobs and pay for conductors for the next eight years if we can reach agreement on how our colleagues deliver better customer service using those fantastic new facilities. "We remain available for talks that are meaningful and clearly focused on how we deliver better customer service in the future." Andy Heath from Merseyrail said: "Just a few weeks after the last round of industrial action, the RMT has announced it will strike again, targeting commuters and leisure-travellers alike. "The union claims to be open to talks, but failed to respond to our most recent offer of a meeting." All of the rail operators said they had contingency plans in place to minimise disruptions during industrial action.